The 'Stowe, we suspected, was sorted. Not so, said Kev, pointing us towards a Felixstowe TV article headed New Coffee Shop Opens. That'll be Friday's venue sorted, then, chauffeur willing. Regular parking spot and the briefest of strolls past number 5, Comptons, then 9-11, Orwell Fisheries, and look both ways before crossing Victoria Street. 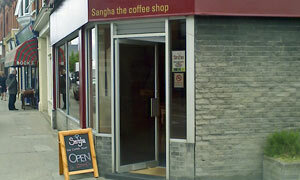 Stop at the "OPEN" pavement sign, gaze at the non-shouty gold lettering above the doorway and follow the arrow inside to Sangha The Coffee Shop. Quality atmosphere with loads of natural light and a good assortment of seating: high chairs by the window, ideal for pedestrian watching, plus tables and comfy chairs. With the staff doing well to ignore Andy's business start-up book, the provocatively titled Starting And Running A Sandwich-Coffee Bar, we looked for a menu. No menu. For savoury stuff, peruse (a) the board for the full run-down and (b) the chiller cabinet for what's actually left. I grabbed an egg & bacon tiger bread baguette -- yum -- and some Patatas Bravas flavour (you tell me) Real Crisps. These aren't imaginary potato products; they're really realistically real. While Andy supped his purple-ish fruit smoothie and Grenvyle poured tea from his futuristic teapot, we flicked through some tick-in-the-box local and national papers. Noticed a handful of paperbacks dotted around too. Relaxing place to be. Blow-up photos on the wall were striking -- good -- but of London -- not so good. C'mon, photographers of Felixstowe, make yourself known. Plenty of space left for dessert. Tough to choose from carrot cake, muffins, cookies, chocolate cake. It's all good. Closed eyes and pointed at maple & pecan slice. Here's where that whole "coffee house" thing comes into its own, 'cos my Americano was excellent: looked good, tasted good, and by golly it was good. Triple certified, too, which I'm sure is the way forward. Best of luck to all at Sangha. May they thrive. If it was a car -- Toyota Prius. If they were passing by -- Nick Hornby.